Wide Belt Pulley (15/32" and 1/2") for industrial and agricultural applications. 2-1/2" Diameter, small enough for adequate RPM on slower speed motors, large enough for long belt life. Cold rolled steel, .670" bore for Delco and Ford alternators. Wide Belt Pulley (5/8", 21/32", 11/16" and 3/4 ") for industrial and agricultural applications. 2-1/2" diameter. Cold rolled steel, .670" bore with special long neck nut. Conversion Bracket to install Bosch or Delco alternators in place of Leece-Neville when the alternator is fixed-mount. The two piece bracket tilts the alternator out approximately .518". Existing drive belt can still be used. Delco To Ford Spacer. Install Delco (2" foot) alternator on Ford vehicles (3" mount). Note mounting hole in alternator must be enlarged to accept Ford 7/16" bolt. Bracket for mounting "truck" type alternators with SAE 4" mounting ear spacing. Machined from mild steel to be customer Welded to existing or custom made mounting plate. Includes grade 5 bolts. UNIVERSAL IGNITION RESISTOR. Ideal for converting 6 volt vehicles to 12 volt systems. Agricultural, industrial and commercial applications. Ford 2N, 8N & 9N Conversion Bracket to install Delco (2" mount) alternator on tractors that have the generator on the RIGHT side. With hardware. Delco to Motorola Alternator Conversion Bracket. Install Delco alternator (2" mount) on vehicles with Motorola (1" mount) alternators. Complete with hardware. Delco to Delco Alternator Conversion Bracket. 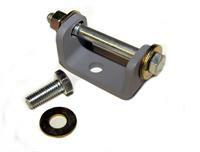 Install Delco (2" mount) on vehicles with Delco 27Si, Type 100 alternators (dual ear mounting). Complete with hardware.